International shipping uses merchant ships to transport cargo from one country to another, and this currently makes up approximately 90 percent of global freight. International shipping is big business and utilizes approximately 52,000 merchant ships. These merchant ships are grouped into five types: container ships, bulk carriers, tankers, specialist ships and ferries/cruise ships. Container ships transport vast quantities/loads of manufactured goods (non-bulk). 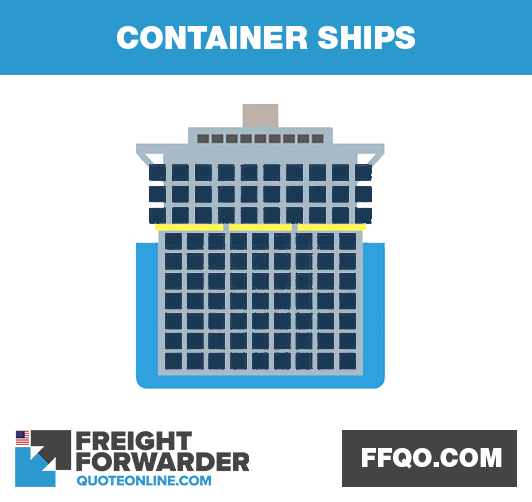 They typically have many rows of standardized truck-sized intermodal containers on their decks. There are currently 17,000 container ships and they make up approximately 33 percent of the merchant fleet. They continue to be built larger and more advanced. The largest container ships are now nearly 400m long, carry over 21,000 containers and produce 40 percent less carbon dioxide. They use state-of-the-art technology in all aspects of the ship, from propulsion and navigation to loading and unloading. Break bulk cargo ships are included in this class. These are ships onto which items must be loaded individually. These include small items, such as bags, boxes, crates, drums or barrels, but also included are large items that cannot be broken down, such as train engines or yachts. 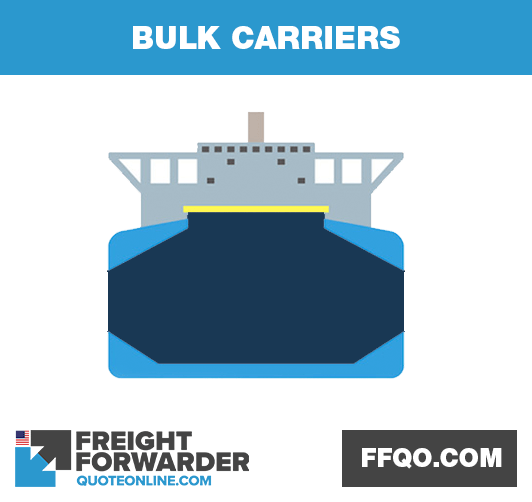 Very large bulk carriers actually belong to the capesize category but are often considered separately. For example, the largest bulk carrier carries upto 400,000 tons of material and their loading and unloading varies in complexity and can often take several days. Tankers transport raw and processed liquids and gases such as crude oil, fresh water, chemicals, juice concentrate or natural gas. 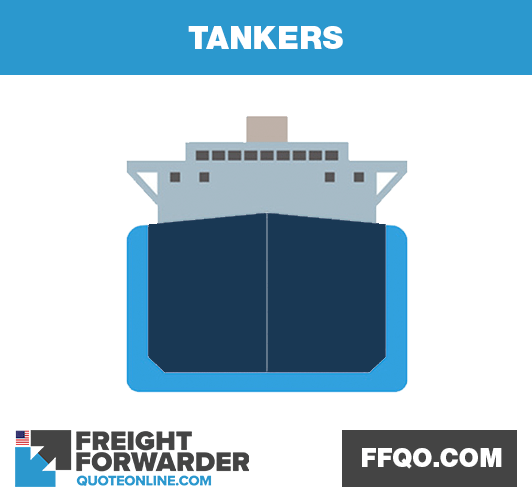 Tankers come in three major classes, including oil tankers, chemical tankers and gas carriers. They typically have a flush deck that is covered by pipelines and vents. The largest tanker is an ultra-large crude carrier that transports 550,000 tons. Tankers transporting liquids suffer from the free surface effect. This is when a large body of liquid being carried aboard a ship responds to the ship’s movements and greatly affects its stability. When the liquid is stored in a tank that spans the width of the ship, it can easily cause capsize. This effect is neutralized by placing subdivisions within the storage tanks. Despite tankers and their operation being heavily regulated, they have been involved in the world’s largest coastal environmental disasters. Examples include the tanker oil spills from the Exxon Valdez, Amoco Cadiz and Torrey Canyon. Anchor-handling tugs are used to tow and secure oil rigs. They can also be used as special supply ships and, in emergencies, provide rescue services. Cable-laying ships are deep-sea vessels that lay telecommunications and power transmissions cables across ocean floors. Drilling ships are mainly used for exploratory offshore drilling; however they can be used to install casing, tubing and sub-sea trees, or provide maintenance for oil wells. Firefighting ships are used for extinguishing shore-based fires and well as fires on ships. Icebreakers navigate and move through ice-covered water to clear the way for other ships. They use a specially designed spoon-shaped bow to break the ice in their path. 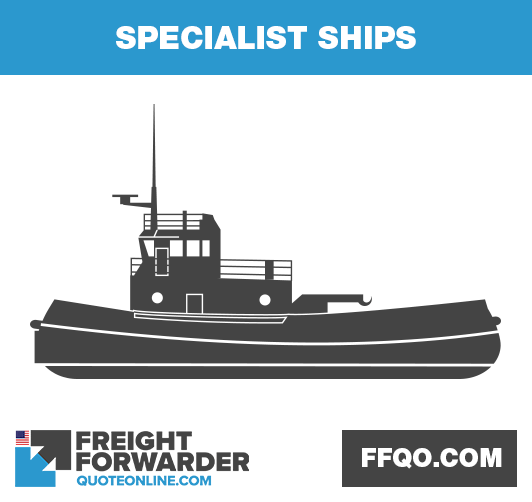 Livestock carriers are either open or closed and are used to transport live sheep, goats and cattle. Seismic ships are used to survey and explore oceans to locate the best locations for oil drilling platforms. Pipe-laying ships are used to lay pipes on the sea bed to connect oil or gas drilling platforms to refineries onshore. Tugboats are strong small ships with very powerful engines that move other ships around by towing or pushing them. They are used to move ships that should not move themselves in port or in a narrow canal. Tugs also used to move ships that cannot move themselves, such as disabled ships, barges and oil platforms. Merchant ships are not exclusively for cargo. Luxurious cruise ships are used to entertain holidaying passengers on pleasure voyages. These are large hotels with swimming pools and vast sun decks, and they travel long distances across seas and oceans. The largest cruise ship is the ‘MS Symphony of the Seas’, which is over 360m long, weighs over 228,000 tons, carries more than 6,600 passengers and has over 2,200 crew. Ferries are used to transport passengers, cars, buses and trucks across short distances, such as rivers, lakes, bays, channels and straits. 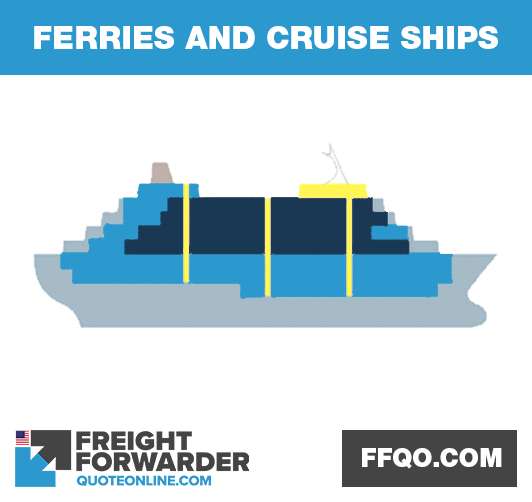 Most ferries are a Ro-Ro (roll on, roll off) class that allows vehicles to be easily loaded as they drive on and off them. The largest ferry is the ‘Stena Hollandica’, which is over 240m long, weighs over 62,000 tons and carries over 1300 passengers, 230 cars and 300 freight vehicles. Need assistance with international shipping? We offer a full range of international shipping services and are confident we can give you the help you need. Our global freight network has more than 40,000 locations worldwide and we provide full-costing upfront international shipping with no hidden costs. Freight Forwarder Quote Online is able to give you the best prices as we have low overheads. If you are looking for international shipping that is fast, lean and transparent, then contact us online and send a message. You can even message us on Facebook for help on international shipping. This entry was posted in News on December 14, 2018 by messengerdev.